I-League side Quess East Bengal FC have announced the contract extension of their sturdy Centre-back Borja Gomez Perez till the end of the 2020-21 Indian Football season. This news comes up as a relief to the East Bengal fans who were dealt a huge blow with the Jobby Justin transfer to ATK followed by several of their key names linked to the Indian Super League sides. 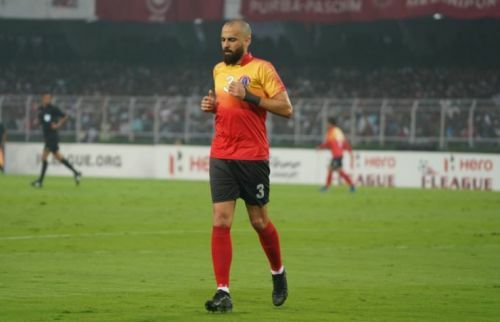 Nicknamed the 'Senapati' or the 'Commander' by the East Bengal faithful, Borja Gomez Perez has been a fan-favourite ever since he landed in Kolkata in September, last year. The Spaniard has been consistently delivered rock solid, resolute defensive performances throughout the season along with World Cupper Johnny Acosta. He has been seen being very animated and vocal with Rakshit Dagar and Manoj Mohammed at the back in cases of nervy communication among the three. The Spaniard has been leading the East Bengal defence and organising the back four in tandem, making him an obvious choice for tenure extension at the Club. Quess East Bengal have recently been in a dilemma over a potential Indian Super League participation without breaking the I-League Club alliance, they are part of. The Media Reports suggesting East Bengal may not play the franchise tournament if not viable have divided the fan base. Gomez's stay at the club will calm down the situation to an extent for sure. Borja Gomez Perez was delighted at his contract extension. He said, 'I am very happy to extend my contract with Quess East Bengal. For me, East Bengal is the best team in India with the best fans. I am sure, we will win the title next season'. Earlier, Brandon Vanlalremdika and Head Coach Alejandro Menendez also extended their contract till 2021 as well. Quess East Bengal Scouts are apparently in Spain, looking for some new Spanish names to add to their roster. A source close to the Club,have also informed Sportskeeda that East Bengal have had initial negotiations with a Celta Vigo B Adrian Mancebo. It will be interesting to see what kind of new names they bring in, keeping in mind the league they are participating in, the next season.